To view 2 more pictures, interactive maps and the full, detailed description of the North Shore at Ridgely Manor community, please Login. A custom home builder makes building a new home in North Shore at Ridgely Manor a memorable experience. Lush land in this exclusive alcove makes the most of scenic Lake Smith. 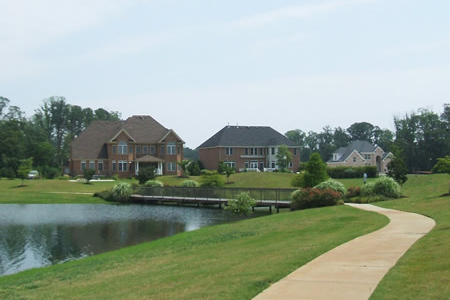 Located in a northern section of Virginia Beach, VA, this waterfront community appeals to those who will settle for nothing less than they deserve. Residents can easily get to Sentara Bayside Hospital and military bases like Naval Station Norfolk, Joint Expeditionary Base Little Creek-Fort Story and NAS Oceana. Choosing a piece of land to start building a new home can be a lengthy decision. North Shore at Ridgely Manor offers many home sites where a qualified custom home builder can whip up a dream home. Homebuyers should consider selecting a spot where they can relax, a place that they can see water but easily access city amenities too. Owners may choose to have the custom home builder add a private boat dock, gourmet kitchen, four levels of living, turret, bidets, five-car garage, mother-in-law quarters, library or whatever their imagination dictates. Virginia contains some of the most picturesque backdrops for living and Virginia Beach is no exception. This part of Hampton Roads is known for its unique beauty and North Shore at Ridgley Manor continues that trend. Building a new home in this development allows residents access to a whole city while surrounding them with the serene sounds of nature to de-stress with after-hours. Homebuyers can head off to Cypress Point Country Club for some challenging rounds of golf. Shop the day away at the Virginia Beach Town Center and Pembroke Mall. To land in a community with all this excitement going on is no stroke of luck; it’s good fortune smiling on you. When you decide that building a new home may be an option for filling your real estate needs, you’re ready to begin the home site search. Land is common but land with buildable lots with views like these can be hard to come by. A custom home builder can turn those visions into brick and mortar that will impress even the toughest critics. North Shore at Ridgeley Manor can be the spot where that elegant residence is just waiting for you to build it. Send me more information about the North Shore at Ridgely Manor new home community.